I turned 30 earlier this month. The birthday was met with happiness and excitement. While my 20s were nothing short of amazing, as my birthday approached, I became more welcome to the idea of ushering in this new decade. A few weeks ahead of my big 3-0, I traveled to Greece with a good friend as a birthday gift of sorts to myself. While there, it became apparent to me that I wanted to celebrate with my friends and family when I arrived back home in the States. There are not many times in life that we can come together with friends just to laugh, cheers and celebrate. In my book, every occasion, even the most simple, can be turned into a party. So, with the calendar pages getting ready to turn to a new decade for me, I figured we should celebrate! On the long flight home from Greece, I had plenty of time to come up with party details. 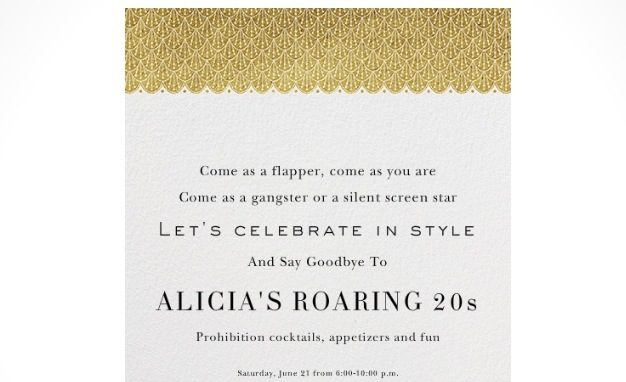 Ultimately, I settled on a Roaring 20s theme, with the thought that for one last night, my friends, family and I would say goodbye to this last decade of mine that was indeed roaring. I used my new favorite internet-based invitation site, Paperless Post, to email invitations. I love this site, because A) it allows you to send invitations in a manner that is green and B) it has the CUTEST designs. There are so many fun designs to choose from and they are all so sleek. A snippet of the invitation I created is below (I cropped the bottom off to cut out my address). My color scheme for the event was white, black, gold and blush pink. With invitations sent, it was time to really get down to planning the party! There were a few things I knew I wanted: A kitschy bar filled with prohibition style cocktails, a photo booth with fun props, bite-sized appetizers to eat and a spectacular outfit for myself! First off, the bar! Prohibition style cocktails seem to be all the rage these days, and after sampling some at various Speakeasys across the U.S., I understand why! For my bar, I opted to serve three prohibition style cocktails: the Gin Rickey, French 75 and Southside. Serving these drinks made building my bar easy: All are gin based! I also need champagne, club soda and tonic, limes and mint. Additionally, I made simple syrup (which is just equal parts water and sugar). For an added twist, I made apple pie moonshine, which was a huge hit! It was so easy, but after I bottled it, I decided to purchase small shot glasses for my friends to drink it out of, as it was VERY potent! I also purchased vodka for friends who don’t like gin and served Batch 19, which is a prohibition style beer. Designing the actual bar set-up was one of my favorite parts of planning the party. 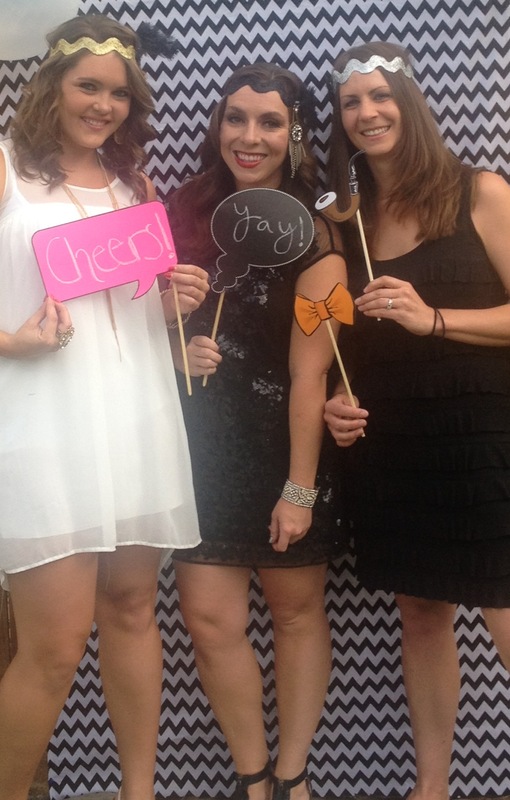 I purchased black and white chevron material to use as my photo booth backdrop. I had some leftover, so I clothed the bar table with it. 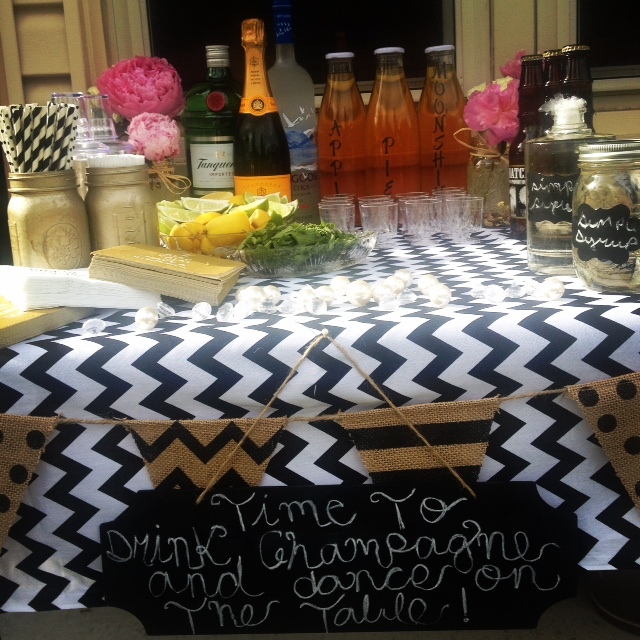 I also purchased a small chalkboard, which I wrote “Time to drink champagne and dance on the table!” on it. I hung the chalkboard on the front of the table, which was wrapped with a black and tan burlap bunting flag banner that I found at Cost Plus World Market. To add a vintage feeling to the bar, I self-bottled the moonshine in bottles I purchased at Cost Plus World Market and then labeled with stickers. The simple syrup was similarly bottled, but labeled with chalk board labels that I also found at Cost Plus World Market. Like most gals, I’m a sucker for paper straws, so it was critical that my bar had some on it! I placed a mixture of black and white polka-dotted and black and white chevron paper straws in a gold spray painted Mason jar on the bar table. Perhaps my favorite part of the table was the flowers on it! 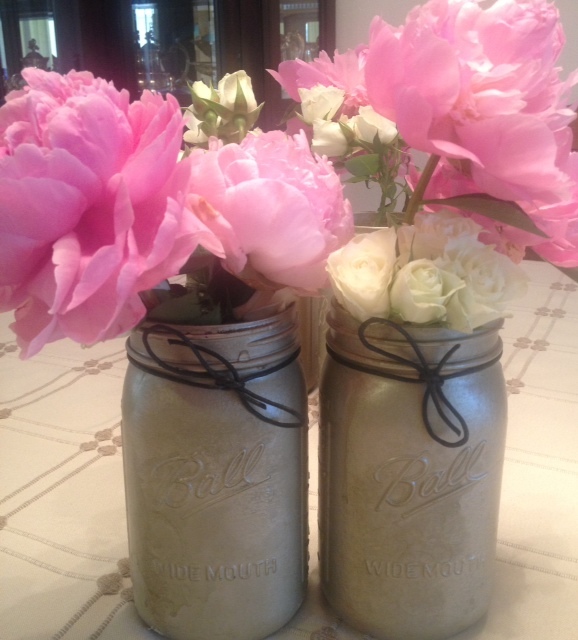 I am obsessed with pink peonies, and luckily for me, they are in season during my birthday month of June! Early the day of my party, I walked to one of my favorite floral and gift stores, Denver’s The Perfect Petal. There, I found the perfect array of blush pink peonies and white antique roses. I bought one stem of each for each of the jars that I placed on the bar table and food table. Earlier in the week, I bought Mason jars in a variety of sizes. I spray painted half of them gold and left the others as-is. Around the spray painted jars, I tied a piece of black burlap string in a bow. A piece of brown burlap was tied around the non-painted jars. On the day of the party, I poured a bag of gold sequins in the water of the jars that I didn’t paint. 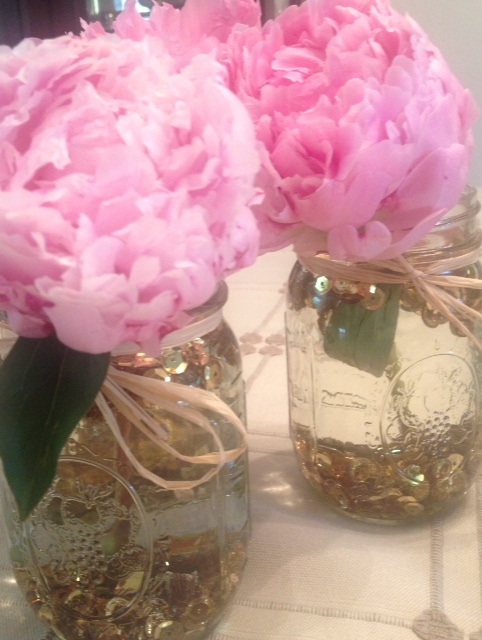 The contrast between the gold painted jars and the jars with the gold sequins in the water, along with the splashes of pink and white that the peonies and roses presented, was really fun! A look at the gold sequined flower jars. A look at the gold spray painted jars. When it came to food, I didn’t want to get too far ahead of myself and find myself cooking all day. As such, I focused on creating a simple menu. I made mini caprese skewers (just place a mozzarella ball, slice of basil and grape tomato on a toothpick), melon balls wrapped in prosciutto, spinach and artichoke flatbread pizzas, a summer orzo salad and sweet molasses meatballs served on pretzel sticks. The cooking was all so easy and everyone really enjoyed the food! You can find all of the recipes on my Pinterest board here. The best food, though, was likely my birthday cake! Every year, my mom buys me a birthday cake from one of our favorite Colorado bakeries, Das Meyer. 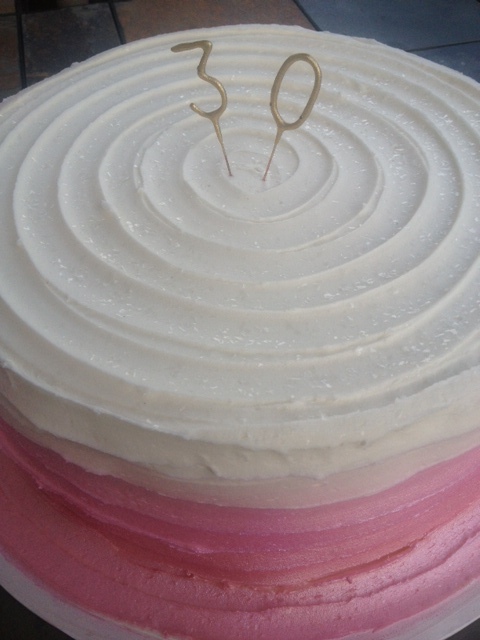 I was really wanting a pink ombre circle cake, so that’s what I got! It was so cute! To top it off, we put “3” and “0” gold sparkler candles from Swoozies on top. It was the perfect way to bring everything together! I was really dying to have a photo booth at my party, because I knew that all of my friends would be dressed up so cute for it. My friends came dressed in 1920s inspired dresses and suits, with headbands to match. I wanted fun pictures to document this celebration that we could look back on and laugh about later. I threw the party at my parents’ house in Denver, which has a huge backyard. 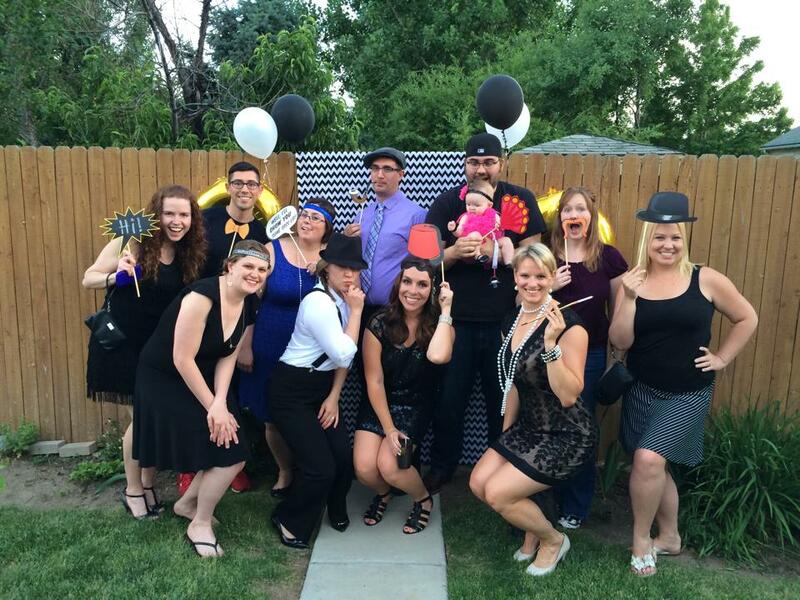 We turned a portion of their fence into a photo booth by hanging a long piece of black and white chevron fabric from it. On each side of the fabric we placed “3” and “0” gold mylar balloons and a mixture of black and white helium balloons. I found great photo booth props from Target that I placed on a wooden TV table in a large glass jar with a chalkboard label reading, “Grab a prop and snap a pic!” near the photo booth. Everyone had a blast with the photo booth! A look at the whole photo booth set-up! 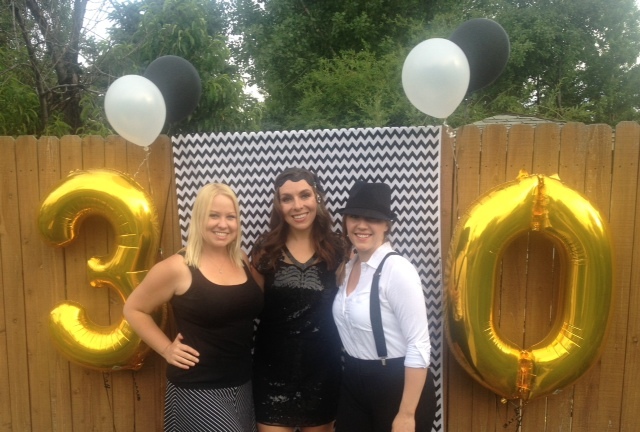 The balloons were cropped out of the pictures, so that only the chevron backdrop appeared. I was so lucky to have found an outfit I adored for my party. I’ve been turning to Rent the Runway a lot to find outfits for events. I love Rent the Runway, because it allows me to wear designer clothes for relatively cheap. With as many events as I attend and cover, shopping can become quite an expense for me. However, using Rent the Runway allows me to minimize that cost and also not continuously have to wear the same thing. For my party, I rented this Sachin + Babi foxtrot dress and accessorized it with this gold dress me up bracelet from Cara Accessories. I loved the subtle shimmer of my Sachin + Babi dress! Top top my outfit off, I made a 1920s inspired headband. I used black sparkly ribbon and a cute jewel adornment that I found at Hobby Lobby to create the headband. All I did to make it, was wrap the ribbon around my head to measure and cut it. Then, I hot glued it together and hot glued the adornment on the side of it. I styled my hair using a 1″ barrel curling iron to make long mermaid waves. I parted my hair in the middle and teased the back of it and then placed the headband on. It was such an easy look to style! I made all of our headbands! It was so easy. Overall, my birthday party was more than I could hope for. That’s because of the people who were there. While all of the decorations, drinks, food and outfits were great, at the end of the day, it was the special people in my life who took time to celebrate with me that made my night special. I really am blessed to have such great people in my life! Here’s to another 30 years!